Rescreen as recommended, every 3 years. Enter value for FPG and/or A1C; or OGTT only. The patient may have diabetes, suggest repeat A1C. If patient has symptoms of hyperglycemia, confirmatory / repeat test is not required, consider patient to have diabetes. The patient may have diabetes, suggest repeat FPG. If patient has symptoms of hyperglycemia, confirmatory / repeat test is not required, consider patient to have diabetes. Confirmatory test required. If patient has symptoms of hyperglycemia, confirmatory / repeat test is not required, consider patient to have diabetes. Requires second test for confirmation, consider repeat FPG and / or A1C test. If patient has symptoms of hyperglycemia, confirmatory / repeat test is not required, consider patient to have diabetes. Requires second test for confirmation, consider repeat A1C and / or FPG. If patient has symptoms of hyperglycemia, confirmatory / repeat test is not required, consider patient to have diabetes. Review Clinical Practice Guidelines' Chapter 4: Screening for Type 1 and Type 2 Diabetes for more detailed information. AIC, glycated hemoglobin; CV, cardiovascular; GDM, gestational diabetes; HDL-C, high density lipoprotein cholesterol; HIV, human immunodeficiency virus-1; IFG, impaired fasting glucose; IGT, impaired glucose tolerance. Conditions that lead to misleading A1C include: hemoglobinopathies, hemolytic anemia, iron deficiency, severe renal or liver disease. Link to Table 1, Monitoring for Glycemic Control. Validated Assay: A1C must be measured using a validated assay standardized to the National Glycohemoglobin Standardization Program-Diabetes Control and Complications Trial reference. Ethnicity: Studies indicate that African Americans, American Indians, Hispanics and Asians have A1C values that are up to 0.4% higher than those of Caucasian patients at similar levels of glycemia (17,18). Research is required to determine if A1C levels differ in African Canadians or Canadian First Nations. Age: A1C values are affected by age, rising by up to 0.1% per decade of life (20,21). More studies may help to determine if age- or ethnic-specific adjusted A1C thresholds are required for diabetes diagnosis. Special Populations: A1C is not recommended for diagnostic purposes in children, adolescents, pregnant women or those with suspected type 1 diabetes. Chapter 4: Figure 1. 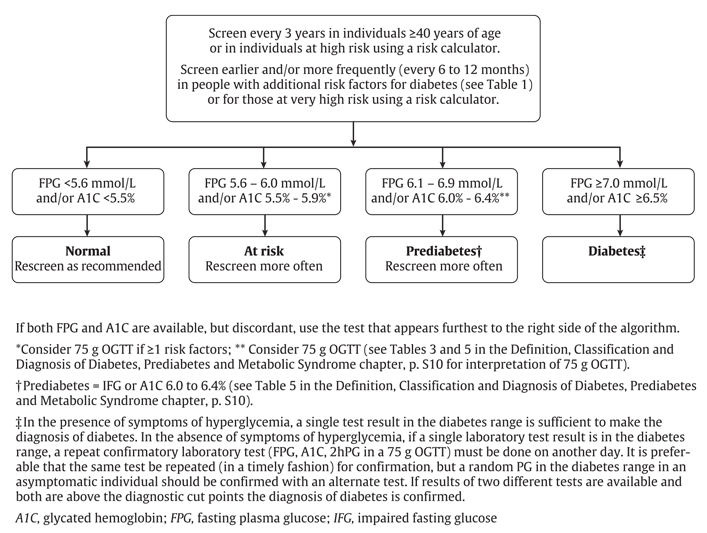 Screening and diagnosis algorithm for type 2 diabetes. 2hPG, 2-hour plasma glucose; AlC, glycated hemoglobin; FPG, fasting plasma glucose; IFG, impaired fasting glucose; IGT, impaired glucose tolerance; OGTT, oral glucose tolerance test. 2hPG, 2-hour plasma glucose; A1C, glycated hemoglobin; CVD, cardiovascular disease; FPG, fasting plasma glucose; OGTT, ral glucose tolerance test.